Tiger Woods, predictably, brought some big-time ratings to the 2018 Farmers Insurance Open where he finished 3 under and T23 on the week. Woods only hit 17 fairways over his four rounds, but he scored well and turned a made cut on the number into a successful week. It was a great week for those televising his performances, too. CBS Sports received a 2.3 rating and 5 share on Saturday and a 2.9 rating and 6 share for Sunday in the final round. Here's how you decipher those numbers, according to GolfWeek. The rating represents the percentage of households tuned to the event, while share identifies the percentage of household televisions in use that were tuned to the tournament. Each point equates to 796,800 households. The pertinent numbers that you need to know are that the third-round ratings were up 53 percent from 2017 and the final-round ratings were up 38 percent. The third-round rating was the highest in seven years. The final-round rating was the highest in five years. Woods saw some benefit, too. With his T23 (better than Phil Mickelson, Jon Rahm and Rickie Fowler, by the way), he moved to No. 539 in the Official World Golf Rankings. That might not seem like a big deal until you remember that he was No. 668 this time last week. 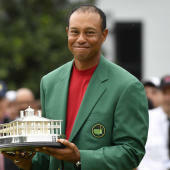 "(I was) very pleased," Woods said of his performance. "I fought hard for these scores. These weren't yawners, down the middle, on the green, two-putt and one-hand all your second putts in the hole. I had to fight for every score on every hole, and sometimes those are more pleasing than the boring rounds. It showed that I had heart. I fought my tail off and it was good stuff."